Methane-linked mechanisms of electron uptake from cathodes by Methanosarcina barkeri: Better Energy Conservation through DIET*? We all know that microbes cross feed and often share metabolites in the environment. Methanogens, microbes that make natural gas components as part of their metabolism often rely on fermentation end-products for example. When these relationships are obligate–one organism needs the end products of another, an this other needs the organism to eat the end products–we call these relationships syntrophic. In most syntrophic relationships, microbes are though to share hyrogen (two electrons and two protons) or formate ( one proton, two electrons, one Carbon dioxide) as metabolic intermediates, however others have speculated the cells can directly pass electrons to each other using extracellualr electron transfer (EET). 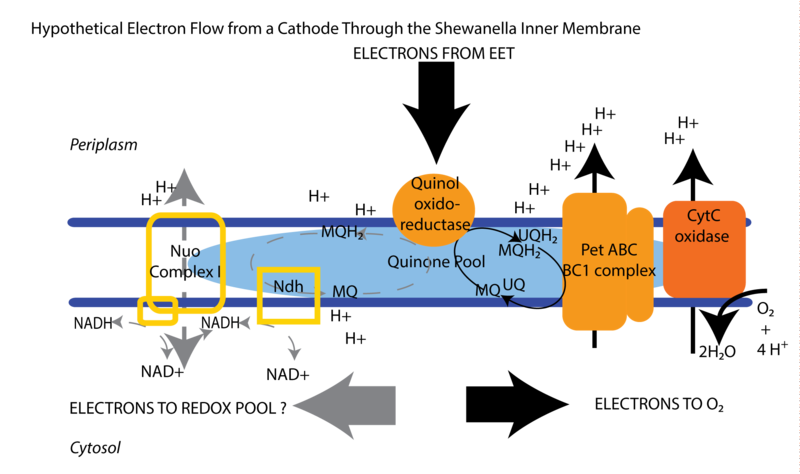 We explored this possibility in Methanosarcina barkeri , and found evidence for a non-hydrogenase linked mode of electron uptake. This supports that Methanosarcina might have a way of doing EET, and now we have to figure out how it works. This might give us new ways or technologies for making methane, that come from electricity and fixing carbon dioxide from our atmosphere. 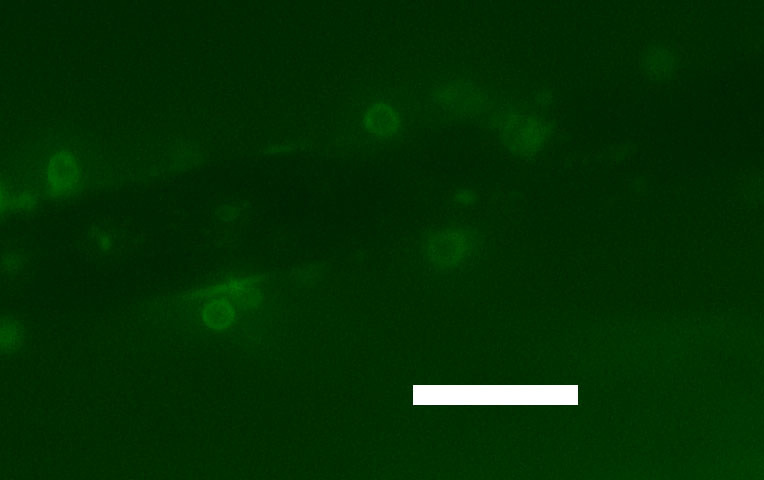 Image is of M. barkeri cells coating a carbon cloth electrode fiber. Cells are stained with NanoOrange which adheres to protein. Scale bar is ten microns. It has been known for a while that microbes can breathe electrodes—use them as a sink for electrons they acquire from the food they eat the way you and I use oxygen. The difference with these microbes is that in order to do this they have to transport electrons outside the cell (in most microbes, including our mitochondria, redox reactions are localized to the inner membrane). In many ways this processes is just an expansion of one of the things I love most about microbes: that they can eat and breathe an amazing diversity of compounds including things that seem absolutely crazy to us humans, such as rocks, toxins, and even radioactive materials. But what has fascinated me recently, is the fact that these processes are reversible . This has led me to try to figure out how or why these same organisms that give electrons to electrodes (breathe), can sometimes take up electrons from electrodes (eat). To do this I had to mix electrochemistry, biochemisty and cell physiology to figure out if and or how these microbes make a living running things in reverse. Though this has important implications for microbe electrode interactions, the bigger questions is (that is infinitely harder to answer): does this happens in the real world? Shewanella on cathodes has important implications for electrosynthesis and systems biology. My current work on this organism is tackling energetic models of reverse electron flow: how much energy do you need (i.e. proton motive force) in order to generate NADH. Empirically we are modeling these processes by measuring the NADH and in the cell under different respiratory rates to see if we can link these processes. This will be the ground work for then trying to perturb and then optimize the system for getting as much electron power going to making biofuels.